The Uni Revue. Good, bad, ugly, poignant. Everyone who sees the show has an opinion and we love that. We love generating discussion and conversation – it’s why we do the show, to get our community talking about what is happening with themselves and their culture. Our show is rude and satirical, offensive and irreverent. We’ve had a lot of negative reviews over the years. We’re not ashamed of that, in fact we even publish them on this site, but our most recent critique for Episode 69 was different. It was an unfair and bias attack on our style of theatre – it was unbalanced and unprofessional. Here is an open letter to the reviewer, Michael McLaughlin. Thank you for your recent critique of our current Uni Revue, Episode 69. As the show title suggests, this is our 69th Revue. Old Nick is apolitical, independent and open minded. We believe Revue is, and always has been, a commentary on our culture and our society. Since 1948 we’ve received an immeasurable amount of feedback on our shows – some positive, some negative, but all expressing valid opinions. Your review of our show however, was misguided, ignorant and wrong. Rather than objectively and rationally critique, we believe you failed to analyse what was happening within a scene or the overall show; we feel you contaminated our revue with your own bias and prejudice. Our song Straight Outta Kempton celebrates the lifestyle of people who don’t live in one of Tasmania’s 4 major urban area (over one third of the population). “I wouldn’t move away even if you paid me”, they sing, “If you wanna piece of this, I’ll give you the tip. Live the rural life is the goddam best s..t!” We put lyrics in our programme so our audience can read, better understand and look back on the show. We wonder if you took the time to think about our material, or even read the lyrics, before you slandered it. “…let’s all laugh at the squinty-eyed overseas UTAS student”, another example of a song you neglected to give proper consideration. This is our commentary about a society unwilling to identify with other cultures, a parody on the reluctance of Tasmanians to associate with our international neighbours, a criticism of latent racist undertones inherent in a community that vilify other humans simply because they are different. “I refuse to live a life that’s written for me,” we sing, “If I think the ending is fixed already, I might as well be saying, I think that it’s OK!” This song is our belief that our children can grow and develop outside of the bigotry of their parents, to build and to become part of a tolerant and accepting society. But you see an Asian student on stage singing in Cantonese (yes, it’s actual Cantonese) and you blindly label it racist. You state there was “…widespread misogyny,” yet the overarching theme and storyline of this year’s Revue is gender equality. Starting a critique with “…this year’s Uni Revue (and quite frankly most Uni Revues I’ve seen)…” makes us think that at best, you simply recycled your past opinions assuming this year was no different, or worse, you let your personal contempt of our style of theatre, colour what should have be an objective theatre review. We don’t understand how you could watch this year’s Revue and not at some point be struck by the gently considered treatment of something that most ageing patriarchs sweep under the carpet, to the detriment of a modern society obsessed with identification and acceptance. Our society is changing and Revue changes with it, this is how the show reflects our culture. Talking about all genders and sexualities being equal isn’t misogynistic – it’s happening, it’s important and your ignorance of the issue is exactly the point we are trying to make. There are some really poignant views in Episode 69 – the “puppet” government and public opinion being controlled by the media is the most important challenge we can make in Australian society at the moment. Criticism on the mistreatment of Basslink and abuse of our electricity reserves needs to be widespread. The Hobart City Council needs to be held to task for misappropriating public funds – they threaten to destroy all the hard work of all the festival, food and art industries by creating sub-quality products that stain the hard fought interstate and international reputation that a growing Hobart tourism market is dependent on. All of this was dismissed. You claim “With Episode 69 there is a lot of punching down.” There’s not. It’s punching out. On a purely social level, the power of parody to transform attitudes cannot be ignored. Breaking the silence and creating debate on things like paedophilia, domestic abuse, irresponsible parenting and drug abuse has been the dogma of revue for years and years. You close your critique by stating “Old Nick does some very good things for the performing arts in Tasmania. The Uni Revue is spectacularly not one of them,” yet the Uni Revue is the largest theatre show in Tasmania. 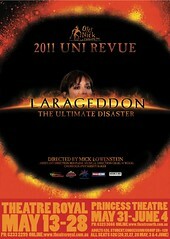 The Uni Revue gets more Tasmanians into a theatre every year than anything else in the state. Again, objective facts have been twisted by your own personal bias. That is “lazy” reviewing and we believe you were punching down when you wrote it. We respectfully invite you back to our show. We’d love you to experience Episode 69 as we intended it to be consumed, as a light hearted way of dealing with serious and heavy social issues. If not, we’d love you to send another reviewer, one who can give a balanced and untainted critique of our show. We’d be very interested to read a second opinion. Uni Revue – it’s there in the title ‘Uni’. It’s a revue by Uni students. I think it’s pretty poor form to be lashing out at the students, who follow a whole 69 year tradition of other students, having their say. ‘The establishment’ rarely gives credit to the youth point of view and it’s often dismissed, but, their point of view is relevant, and what a great vehicle – comedy. I think the review is just another misguided and bigoted old person dismissing youth as not having anything to say. When really, as Old Nick so clearly pointed out, this one small part of a world-wide tradition of Uni and Varsity revue. If he cares to leave his comfy recliner to see maybe he’ll begin to understand. Wife and I attended after invite from some friends to join them. Revue was exactly what we needed – was able to put day to day life on hold, be entertained, had laugher a plenty, great satire and not so subtle digs at the massive issues faced by Tasmanians. Loved the efforts of all those involved. Thank you ????? I enjoyed the show but there were technical hitches in regards to the headsets/microphones not working properly and consequently I was not able to hear the actors properly. Thanks for the feedback Lynne, we’re glad you enjoyed the show. We’re sorry about the technical issues – we had some faulty equipment that has since been replaced. We hope it didn’t detract too much from the performances. Well written and straight to the point. Revue should never be seen for anything other than what you say. It’s never going to push the envelope so far on a single issue insofar as the creatives have to put their soul into the work. No, it is a biting satirical look at a range of relevant issues the state/community is facing. Political and social misgivings are fodder for the revue stage. The stagecraft required to push these messages is not intended to be subtle or symbolic. Revue aims straight at its target and makes no apologies content or form. Reviewers need to lighten up and think about the artform they are reviewing. Try to be a high-brow critic of revue and you’ll fail every time. Keep punching out Old Nick. May your best years be ahead of you! Couldn’t agree more, Jason. We don’t mind criticism, but attacking Uni Revue for being a revue seems a bit unfair. We all know what the Revue is about, we are even told before the show to leave we don’t like this, that and the other. Good god, what is wrong with people, clearly these people go just to have a whinge and to be do gooders, political correctness once again gone freaking mad. What’s the words of today, if you don’t love it, leave it.